Bacon is awesome. You get no argument from me there. I love it on everything, and all by itself. 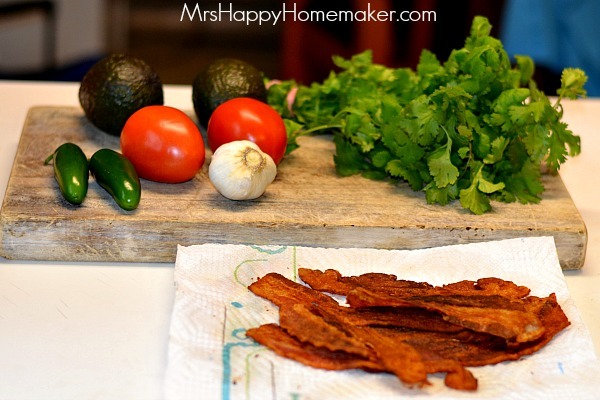 When I cook bacon for a recipe, I have to make triple double the recipe calls for – you know for snacking purposes. To not snack on bacon when you’re cooking it would be a sin. And when I say I love it on everything, that’s no exaggeration. 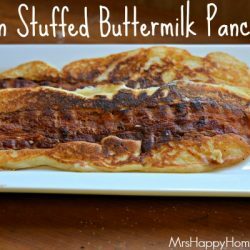 On pork chops, in cheese dip, stuffed inside waffles, or atop a pastry…. I’m all over it. Everything is better with bacon. 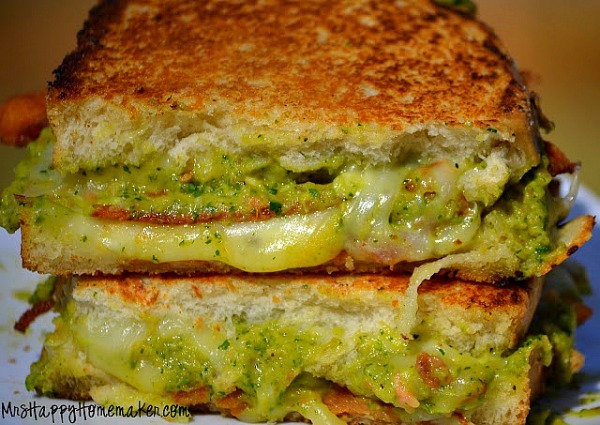 Speaking of things I like bacon on… You remember these Bacon Guacamole Grilled Cheese Sandwiches? If not – you need to go check them out because they are ah-mazing. 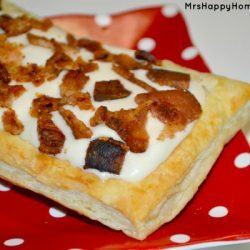 Well that recipe is what inspired this new bacon topped deliciousness. Yes, that’s what I said. Guacamole just got even better. How did we never think of this one before? Now that it’s in my life, you can be sure it’s going to be a regular visitor to the dinner table… and a new accompanyment to my Super Nachos. You will find yourself not being able to stop snacking on this. 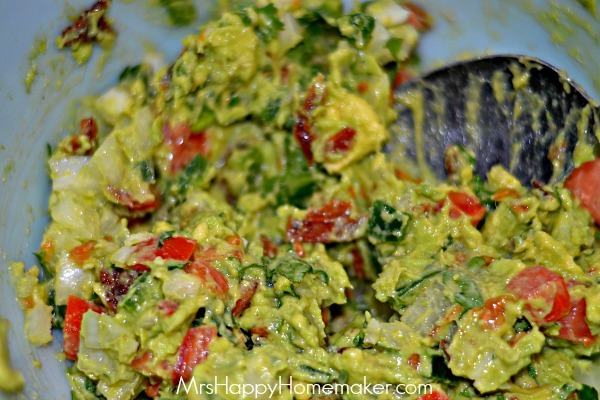 It’s the perfect guacamole and your tortilla chips new best friend. 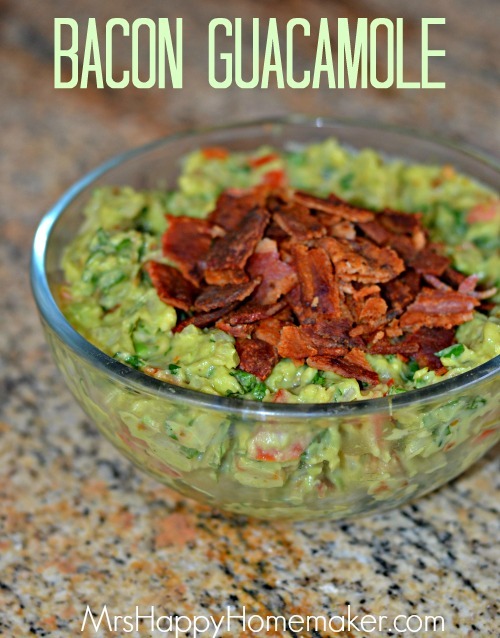 I’ve never had a guacamole better than this one – I told you bacon makes everything better. The prep for this is so, so simple. You literally take everything and dump it into a bowl – and stir it all up. 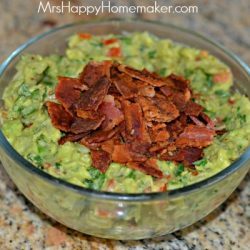 Mashed up avocado, a diced onion, a couple cloves of minced garlic, 1-2 diced roma tomatoes, 1-2 diced jalapenos, half a bunch of chopped cilantro, a pinch of ground cumin, 4 slices of chopped bacon, – and a little salt & pepper to taste. You can add the juice of a lime too if you want. 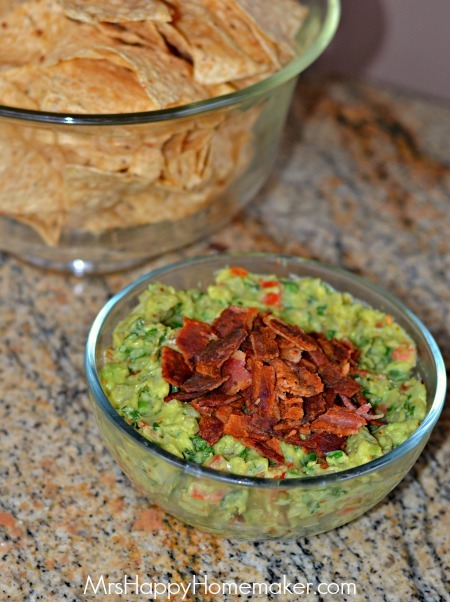 To keep the bacon guacamole from browning, take the avocado pit and stick it in the middle of your dip. It has super magical powers (or something like that) and will keep it all pretty. Crumble up the last 2 slices of crispy bacon & sprinkle on top for the final touch. Oh yeah. Time to dig in. 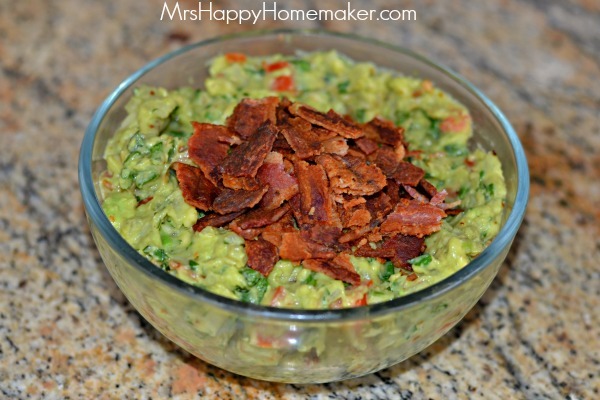 In a medium sized bowl, combine the avocado, onion, garlic, tomatoes, jalapenos, cilantro, 4 slices of crumbled bacon, cumin, salt, pepper, & lime (if using). 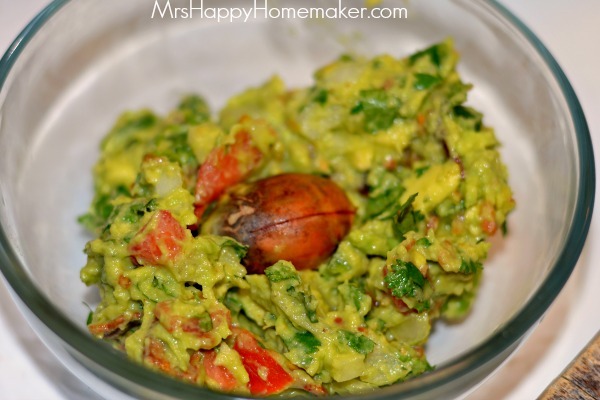 Stick the avocado pit in the middle of the guacamole to keep it from browning. 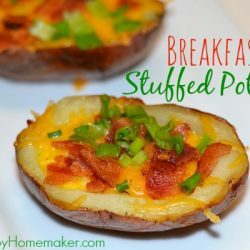 Top with the remaining 2 slices of cooked crumbled bacon. Next Post » Mrs Happy Homemaker Shares Low Calorie & Sugar Free Desserts on Fox8 News (Videos)!